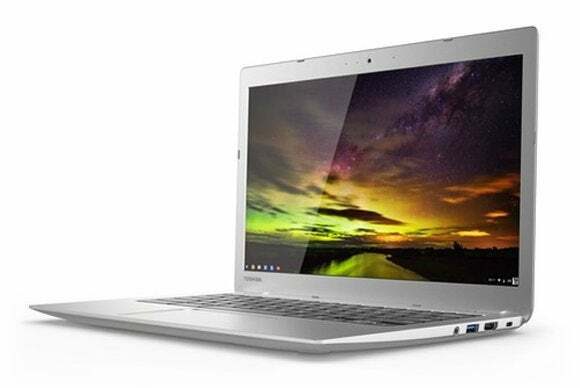 Toshiba has one of the better Chromebooks in its model CB35-A3120, and now the manufacturer is promising to improve on that design with one new Chromebook 2 model, and to cost-reduce it with another. Both SKUs have a 13.3-inch display squeezed into a thin-and-light, 12-inch chassis; and both are powered by Intel Celeron processors. Toshiba outfitted both models with 802.11ac Wi-Fi adapters, too. The new models have one USB 2.0 and one USB 3.0 port, where the earlier model had two of the faster variety. The models retain built-in webcams with mics, HDMI outputs, and SD card slos. The Chromebook 2 is sitting atop Toshiba's original Chromebook is slightly smaller—even though both designs have 13.3-inch displays. But the $330 model comes with 4GB of memory and an IPS display with native resolution of 1920x1080, while the $250 model is outfitted with 2GB of memory and a TN panel with native resolution of 1366x768. Both models offer 16GB of onboard storage and 100GB of Google Drive space. Neither model, however, comes with a touchscreen. 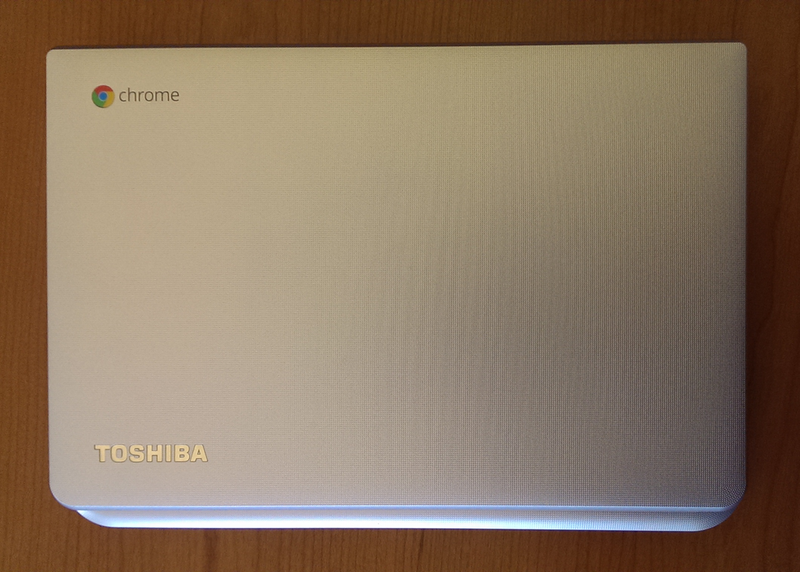 The Chromebook 2 is also thinner than Toshiba's first-gen Chromebook. Toshiba enlisted the aid of headphone manufacturer Skullcandy to improve the audio performance of its Chromebooks, and one of the changes was to relocate the speakers from the bottom of the chassis to locations beneath the left and right sides of the keyboard. In a briefing last week, Toshiba product manager Carrie Cowan credited Intel’s Bay Trail-class CPUs with increasing the Toshiba Chromebooks’ battery life. The chips are not only more efficient, but run cool enough that Toshiba’s engineers were able to dispense with cooling fans. Cowan said the lower-resolution model should deliver battery life of 11.5 hours, while the higher-resolution model should last 9 hours. Bored with silver Chomebooks? 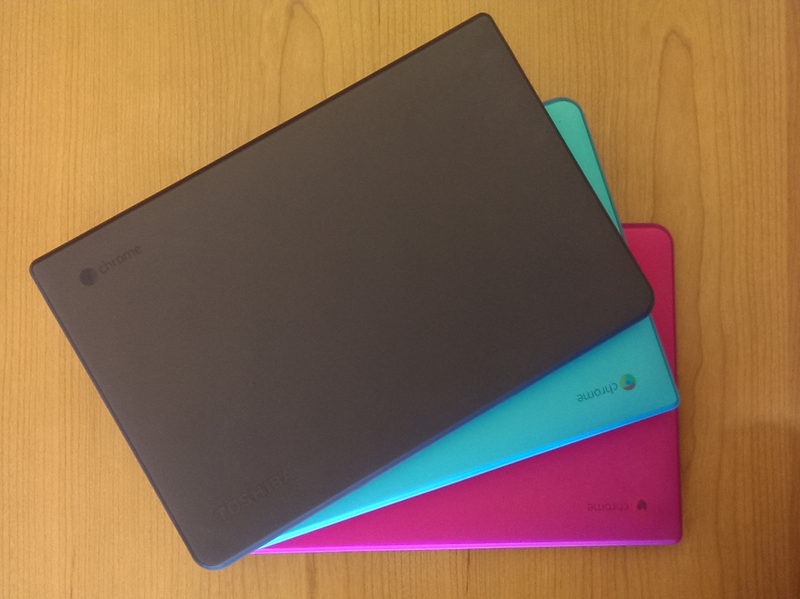 Toshiba is now offering optional snap-on covers in charcoal, aqua, and rose shades. Toshiba expects both models to be available for sale at retail on October 5.